To reach Macau we must ride a high-speed ferries at the ferry terminal in Hong Kong. It's only 55 minutes to reach Macau and the ferry is clean and good. Our main transportation during the trip was by bus, it's provided by the travel tour. 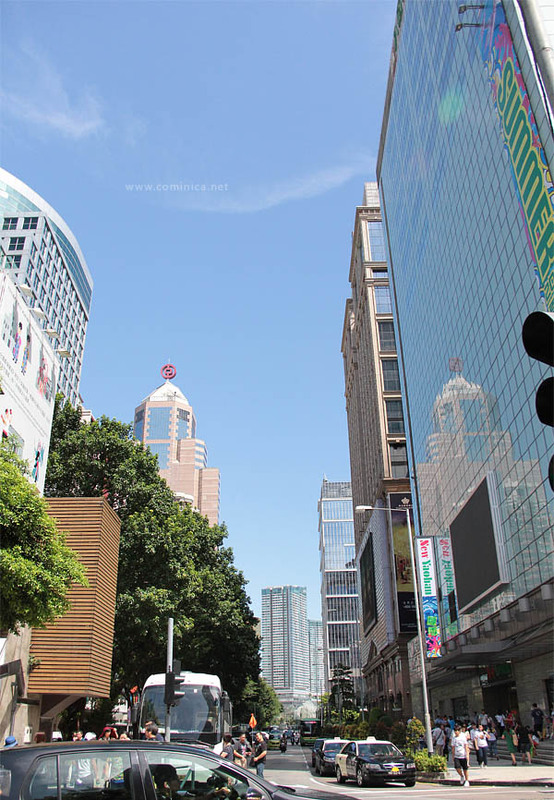 Unlike the rainy Hong Kong, Macau was super super hot that day! 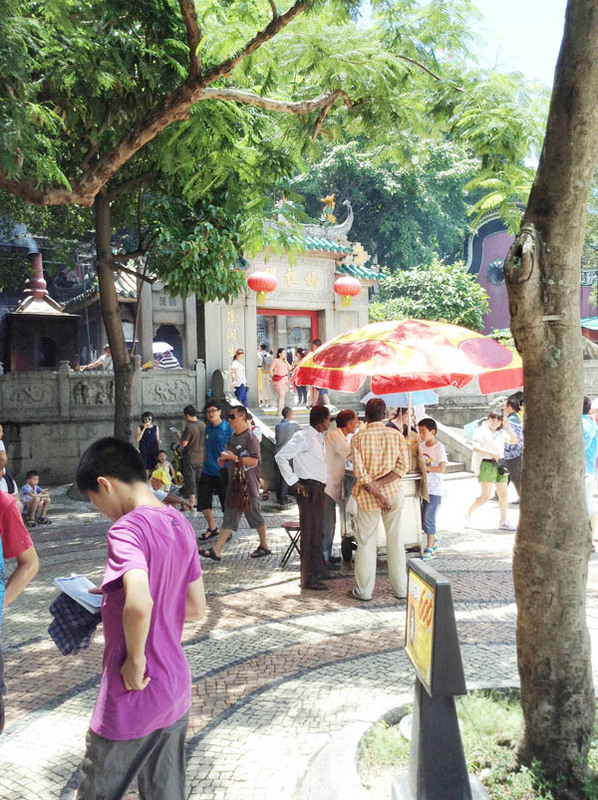 Our first destination was Ah Ma Temple, is one of the oldest and most famous Taoist temples in Macau. Built in 1488, the temple is dedicated to the goddess of seafarers and fishermen. 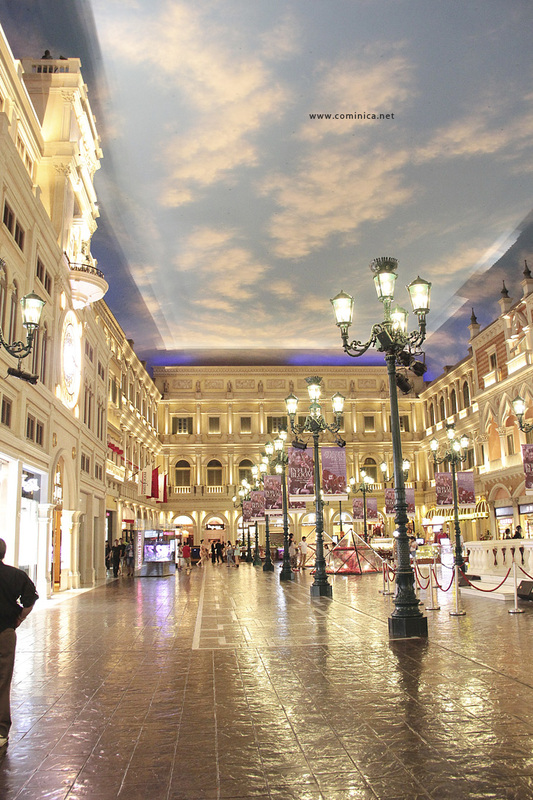 You know that The name Macau is thought to be derived from the name of the temple! I didn't went into the temple because it was crazily crowded. I prefer to wait outside with my sister and then we can took some pictures while waiting for them. 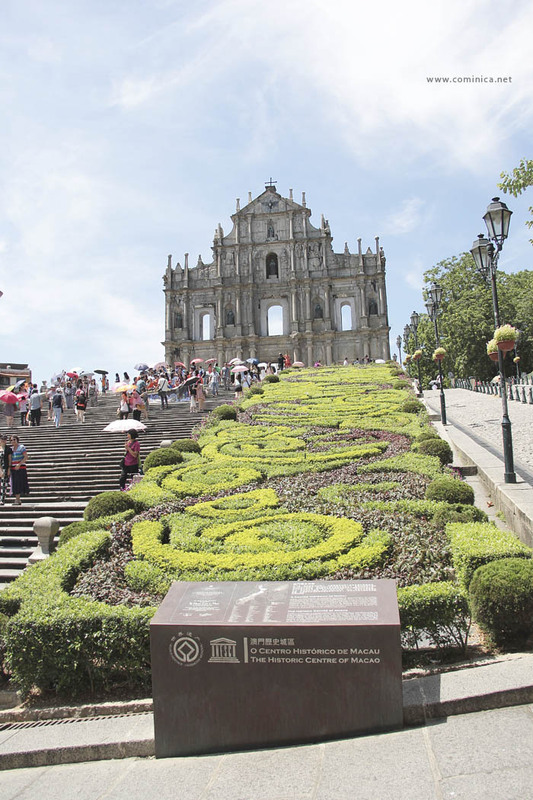 We went straight to the ruins of St Paul Cathedral after that, the ruins are one of Macau's best known landmarks and officially listed as part of the Historic Centre of Macau, a UNESCO World Heritage Site. And yes, it's fascinating! In front of the Cathedral's ruins there's St. Paul's Road or "Rua de Sao Paulo", it is the historic road that leads to the Ruins of St. Paul from Macau China's Old City centre. There're many stores along the road and also restaurants. I really hope I had more time to explore this place but too bad because this was a tour, we must follow the schedule. Good that I passed the road and saw many beautiful buildings along the road. We walked to the restaurant by foot so I had a chance to capture some pictures, hehe. The restaurant is located inside a hotel and it was like a buffet lunch. I don't remember the restaurant's name but it was quite good. I ate the popular Egg Portuguese Tart there and it was soo yummy! After lunch we went to watch The Dragon's Treasure show at City of Dreams. This show also known as ‘the Bubble Show’, this attraction is a must-see when you’re planning to visit Macau. You can dive into Dragon’s Treasure Macau world in this totally immersive multimedia show, if you think 4D is good, this show is 99% more amazing~! 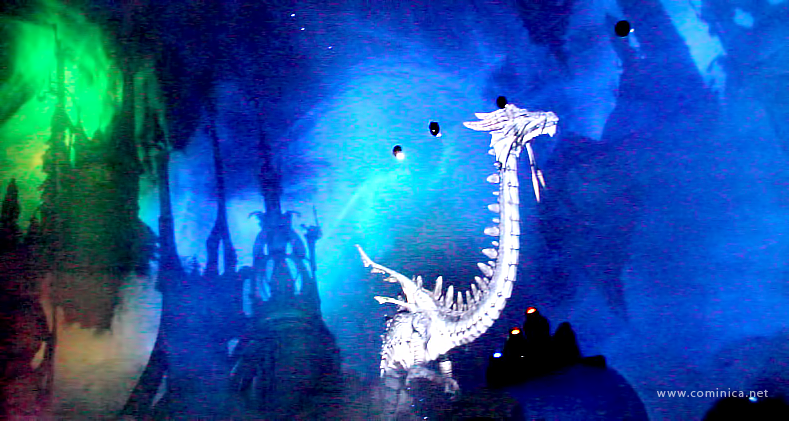 I'm still amazed with the dragon show, I think it's the best theater show I've ever seen. If you go to Macau, you must see it! 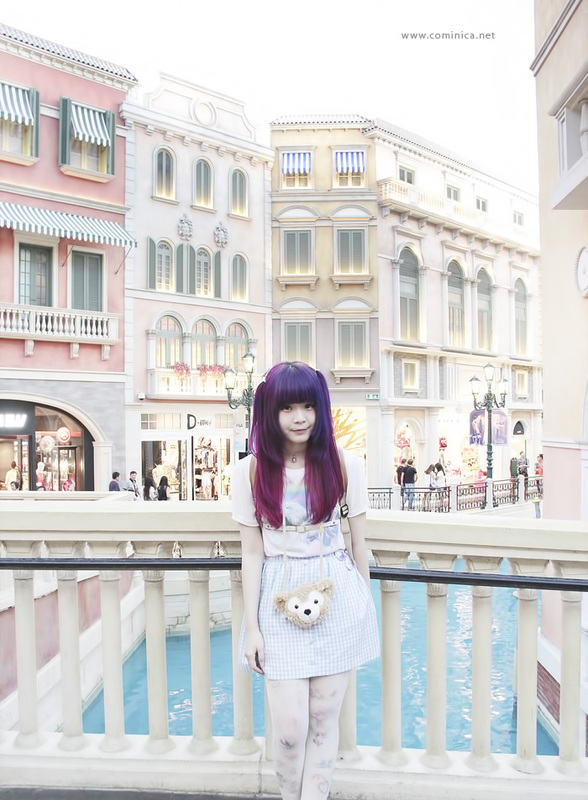 After the amazing show, we went to The Venetian Hotel for check in. And yes if you think you've saw it somewhere, it is the hotel in Boys before flower drama (a Korean Drama). This hotel is really amazing, they made the interior like a modern Venice! All the architectures are so beautiful, even the cloud, yes! the cloud is look like a real cloud. And the blue water is so calming, I really couldn't stop admiring everything there..
And you know, all the clouds there can change from day to night! It becomes darker and in the afternoon looks lighter, cool or not? haha I swear this hotel is super amazing, too bad I only stayed 1 night. You also can find many Japanese fashion brand here such as Snidel, LizLisa, Nice Claup and many more. And most important is all the shopping stores here are all duty free, yes it's free of tax! It's authentic and original from Japan but with less price, tempted or not? My dinner was Sushi (again) because I didn't know what to eat. The food court was so so crowded. I think the reason is because that time was a holiday season, there were so many tourist from China, Korea and Japan. I didn't have a high expectation for the Sushis but so glad they were good~! Be careful with your budget because all the foods are so overpriced. I returned to my room at midnight, actually we wanted to continue walking around there because the hotel is so big! The time wasn't enough... But we need to sleep and pack our luggage because tomorrow morning we will go to Shenzhen. 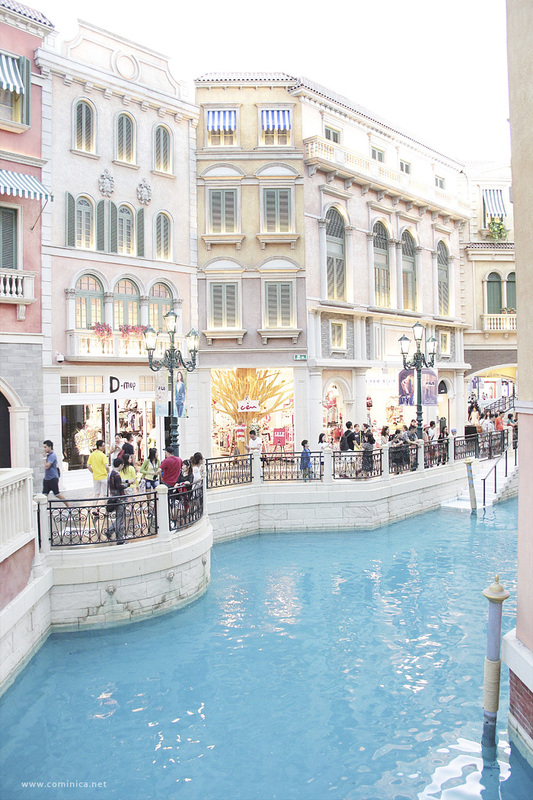 oh my.. everything looks soo beautiful and also magical ^^ I'd like to visit Macau!!!! I'd take sooo many pictures if i were there.